Rebekah VanWieren has been awarded the Western Region Award for Excellence in Teaching from the Association of Public Land-Grant Universities. VanWieren, an assistant professor in the Department of Plant Sciences and Plant Pathology in MSU’s College of Agriculture, said she is honored to have won the award, which recognizes outstanding instructors in food or agricultural sciences who are seven years or less into their academic teaching careers. VanWieren teaches undergraduate landscape architecture courses that cover a broad range of knowledge and skills, beginning with using hand drawn illustrations to communicate preliminary design concepts and landscape construction details, and a course on site engineering where students bridge landscape design with civil engineering and learn about grading, drainage and ways to manage storm water. She also teaches advanced landscape design, a capstone class in which students spend a semester on service-learning projects in Montana, such as community park and trail design and vacant land redevelopment plans in areas challenged by past industrial uses or disinvestment. Working with communities that don’t have the funds to hire a landscape architect in early design stages, VanWieren said she first asks her students to “think outside the box” to encourage innovation. But, as they begin building knowledge and skills, they then focus on the plausible to provide ideas the community finds valuable. One service-learning project pairs VanWieren and her students with the Fort Peck Tribes Office of Environmental Protection and the U.S. Environmental Protection Agency to revitalize a former main street gas station into a plaza with green spaces, something she said could change the trajectory of the space and improve environmental health and human well-being. VanWieren’s success in integrating scholarship with outreach led to her being awarded the 2017 President’s Award for Excellence in Service Learning at MSU. Prior to coming to MSU, VanWieren worked as a landscape architect at firms in Michigan alongside planners and civil engineers. Her focus then was primarily on leveraging the design of green spaces on commercial properties and streets to reduce the impact of storm water on waterways, an issue she said is becoming more important as development increases even in semi-arid Bozeman. 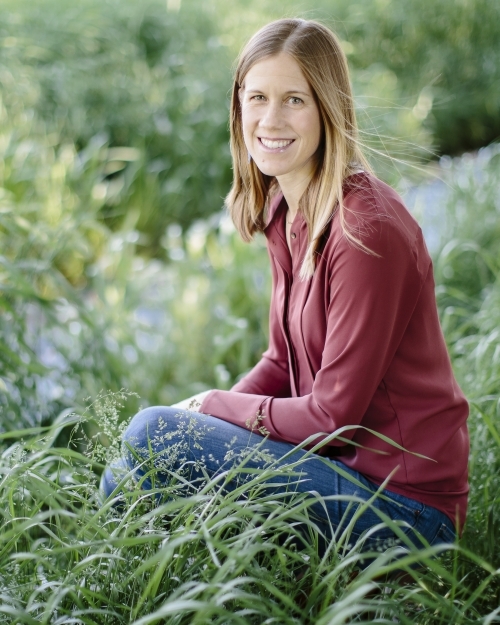 Before working in practice, VanWieren earned bachelor’s degrees in both biology and environmental science at St. Olaf College in 2001, followed by master’s degrees in both landscape architecture and natural resource planning and policy from the University of Michigan in 2009. Rebekah VanWieren was also featured in the Landscape Architecture Foundation website as a 2008 Olmsted scholar. Click here to read the article!